This recipe is quick and easy. It mixes the flavors of two varieties of fish. 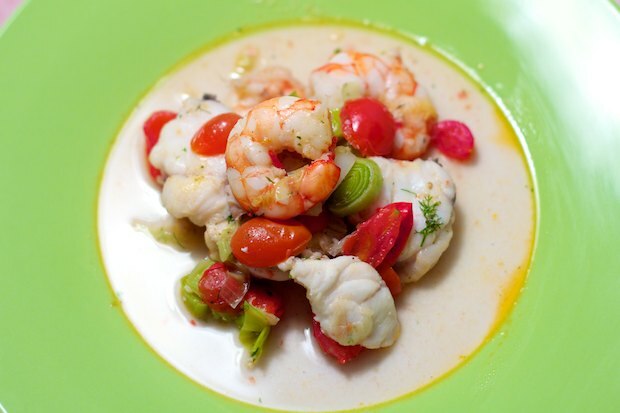 Make sure you have the monkfish cut into pieces and use shrimp that have been peeled, this way everything will be fast. Thoroughly wash and dry the fish and vegetables. In a large pan, add the olive oil and leek that has been cut into thin rounds. After two minutes, add the halved tomatoes and monkfish. After five minutes, pour in the martini and let it evaporate. Add the shrimp, salt, and pepper and continue cooking for 5 minutes. Turn off the burner. Serve on individual plates with a some chopped fennel fronds. Posted in Fish and tagged with Bocconcini di Pesce, Fish Bites. RSS 2.0 feed.